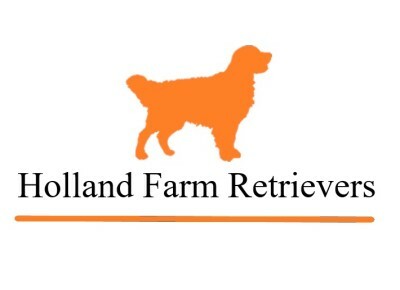 At Holland Farm Retrievers, we take great pride in producing the best puppies in the midwest. We are not a large breeder, we breed a couple litters a year and strive to keep improving the breed each and every year. All the dogs in our program come from excellent pedigrees with champion lines. Each of our litters are whelped in our home and kenneled in our living space to offer the most socialized puppy the breed can offer. For us, it began 26 years ago with a female golden retriever named Mioak's Maggie. I brought her home to have as a companion and a hunting dog. After she was trained, I saw how intelligent, loyal, versatile, and energetic the breed was. We chose to breed golden retrievers because it would give us the opportunity to share these positive traits with other families. Today, the Mioak's lineage remains in one of our females, Little Miss Captain Morgan. Morgan is an accomplished hunter, an affectionate dog and an excellent mother. She carries on the dark golden trait that is desired by many golden owners around the world. Along with other ethical breeders around the world, we have realized the importance of super healthy dogs which is why Morgan is OFA , CERF certified and also Ichthyosis clear.